A Canadian Court has ruled that Boycott, Divestment, Sanctions (BDS) activists were denied free speech and campaigning rights when the city of Montreal tore down their posters highlighting an Israeli atrocity, during an election campaign in Canada. TRNN discusses the case with Bruce Katz, one of the main plaintiffs in the case. Gregory Wilpert a German-American sociologist who earned a Ph.D. in sociology from Brandeis University in 1994. Between 2000 and 2008 he lived in Venezuela, where he taught at the Central University of Venezuela and then worked as a freelance journalist, writing on Venezuelan politics for a wide range of publications and also founded Venezuelanalysis.com, an English-language website about Venezuela. In 2007 he published the book Changing Venezuela by Taking Power: The History and Policies of the Chavez Government (Verso Books). He moved back to the U.S. in 2008 because his wife was named Consul General of Venezuela in New York. Since returning to the U.S. he has been working as an Adjunct Professor of Political Science at Brooklyn College. The Boycott Sanctions and Divestment movement, or BDS movement, which targets Israel’s treatment of Palestinians, was able to register an important court win last month in Canada. A court in Montreal ruled in favor of BDS Quebec and the Canadian Communist Party when it said that the city of Montreal violated election campaign rules and must pay damages to the two organizations. 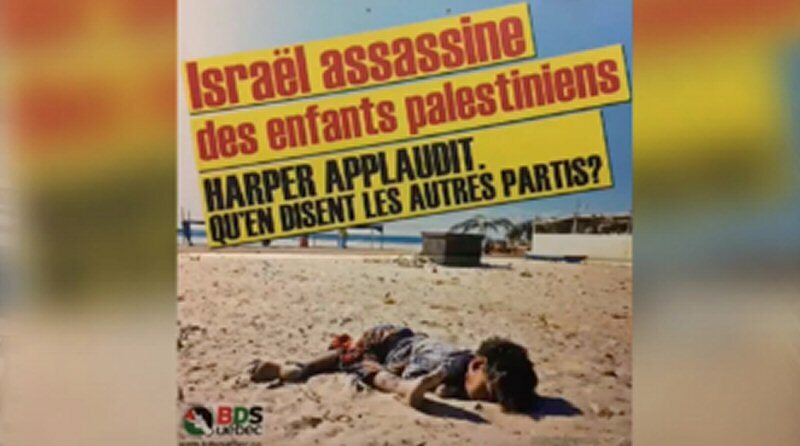 The case began when Montreal City officials removed BDS and Communist Party posters during a federal election campaign that took place in Canada in 2015. The posters called attention to a 2014 Israeli bombing that killed four Palestinian children and featured a picture of one of the dead children. According to the ruling, city officials acted illegally when they removed the posters. Joining me now from Montreal, Canada is one of the main plaintiffs in the case. Bruce Katz. Bruce is the official agent of BDS Quebec. Welcome to The Real News Network, Bruce. GREG WILPERT: So the court ruled that the city needs to pay twelve thousand dollars in Canadian dollars in punitive damages to your organization, BDS Quebec, in addition to the cost of the posters that they removed. How do you feel about this result and what does it mean for the BDS movement? BRUCE KATZ: Well, we’re extremely pleased by the fact that we’ve managed to win a jurisprudence, and that was the overall objective in the first place. The jurisprudence is important because for one thing, it is something that enhances or reinforces the integrity of the electoral law of Canada, which the city of Montreal stepped all over during the federal campaign in 2015. It’s also a victory, as far as we’re concerned, for freedom of expression since the city of Montreal took down our posters arbitrarily and actually were condemned by Elections Canada a couple of months after the incident. Because I had kept Elections Canada informed on a regular basis of exactly what was going on. Also, for us, this is a victory for the legitimacy of BDS Quebec and its campaign against Israeli aggression against the Palestinians, and also as something that underscores the fact that the federal government under Justin Trudeau has recently condemned BDS as being synonymous with anti-Semitism. This is, of course, not the case. As a matter of fact, I think it’s a defamatory statement to begin with. But the victory for us in the Quebec Superior Court is a victory also for the legitimacy of BDS Quebec and for the legitimacy of the Boycott Divestment and Sanctions campaign against Israel. And as I said, and I repeat, it is a victory for freedom of expression in this country and will be applicable, since it concerns the electoral law of Canada, it is applicable in all provinces and we’re very pleased with that result. GREG WILPERT: Did you ever find out who was exactly behind the decision to remove the posters or why they were removed? BRUCE KATZ: No. The only thing that our lawyer, and I would like to take a moment to express our gratitude for his excellent work. And what he was able to do in examinations called discovery, was the fact that the city had issued a blank order, it was a general order to take down BDS Quebec posters. And these were large posters, they were hard-hitting posters, four feet by four feet, and translated from French, what we had written in bold letters on the posters with a depiction, a photograph of one of the Palestinian children who was killed on the beach in Gaza. We printed on the posters that Israel assassinated Palestinian children. Harper, who was prime minister at that point in time, applauds, what do the other parties have to say? Well, obviously, that ruffled some feathers, despite the fact that we had done all of the necessary documentation to back up what we printed on that poster so that the poster was absolutely true in its comments about Israeli killing of Palestinian children. Despite the veracity of it, the City of Montreal took the posters down. They have been shown to have trampled on fundamental rights, really, rights and freedom of expression, the integrity of electoral law in Canada, and in a way, defamed us, although the court did not give the individual members of BDS movement or of the Communist Party, for that matter, did not award them punitive damages. Nevertheless, as I’ve said, we’re elated by the victory we achieved for BDS movement and for freedom of expression. GREG WILPERT: Now, how have city officials and pro-Israeli lobby groups reacted to this court decision? BRUCE KATZ: For the time being, the decision itself is fairly recent, we have not heard of any reaction to this point. I’m sure that their reaction will come and that the pro-Israel elements and certain elements of the political class will continue to say that BDS equals anti-Semitism, although it’s clear that this is merely a sophism. And as a matter of fact, there have been reactions even from people in Israel, from academics here in Canada, criticizing the manipulation of the notion of anti-Semitism, which has nothing to do with criticizing Israel. GREG WILPERT: Certainly a story we’ve been following for quite some time. And I thank you very much for having joined us today, Bruce. I was speaking to Bruce Katz, official agent of BDS Quebec. Thanks again, Bruce, for having joined us.